A dog cooling pad may be just the thing your pup needs in hot weather or if he's been exercising or quite active. It's a great, safe and easy way to help him cool down naturally and stay comfortable no matter what the weather. There are many different brands and styles of pads available, in a variety of sizes and designs. As such you can not only get one that is comfortable for your dog but also fits in nicely with your home décor or can go with you when you travel. Like cooling collars, cooling pads are designed to help dogs maintain the proper body heat in warm weather. Because dogs don't sweat when they get hot the way humans do, they can have trouble getting rid of excess body heat. Their natural method for getting relief is panting, but sometimes, in extreme heat, panting just can't get the job done. That's when they could use an extra cooling "boost" to bring down their body temperature. There are different types of pads, some that work off of electricity and others that contain foam and superabsorbent crystals that soak up water and then allow it to slowly evaporate and take excess body heat with it, the same way we do when we sweat. A dog cooling pad should never contain any toxic chemicals or anything else that could be harmful to your pet. For pads that don't use electricity, you simply soak the absorbent material in water and then place it in its specially designed cover so your dog can reap the cooling benefits. A dog cooling mat provides respite from the heat. 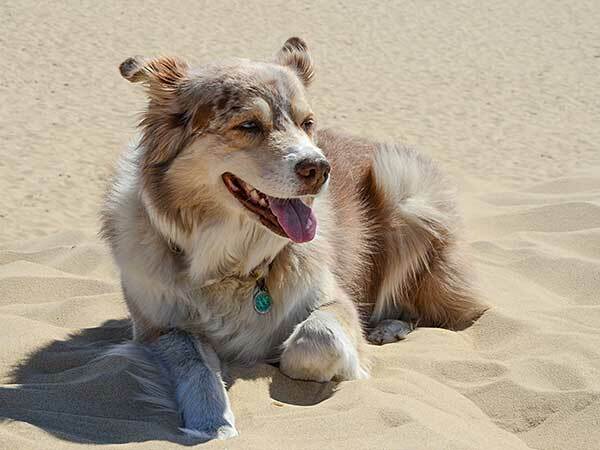 Any dog can benefit from the effects of a dog cooling mat, but they are particularly helpful for active breeds like the Australian Shepherd. Because Aussies tend to be outside and moving a lot in hot weather, either while working or participating in agility trials, and because they like to please and will keep moving until you tell them not to, they can overheat quite easily. In order to avoid heat stroke or heat exhaustion, a cooling pad can be an ideal solution. Not only are cooling pads available in a variety of colors and styles, but some even come with features that provide extra joint support, a plus for dogs who are suffering from arthritis or hip dysplasia. And because they can go with you when you travel, they are also ideal for use by agility competitors, giving them a spot to cool down and relax between course runs. If you are considering a dog cooling pad, it is important to follow all of the manufacturer's instructions and only use it as directed. Also, you should keep the pad out of direct sunlight. The pads work best when kept in a cool room or, if outdoors, in a shady spot. This will allow your dog to get the maximum benefit. And remember, in order for the pad to work the dog has to want to use it, so let him get used to it gradually and never try to force the issue. Nobody likes to see their furry friends suffering, so when hot weather gets to be too much why not consider getting your pet a cooling pad? This way he can stay safe and comfy and you won't have to worry about the heat taking a toll on his body. A dog cooling pad can be the perfect way for your pup to chill, no matter what the weather!